I live Regina with my amazing wife Kaylene, and work as a film producer specializing in the Fashion and Wedding industries. 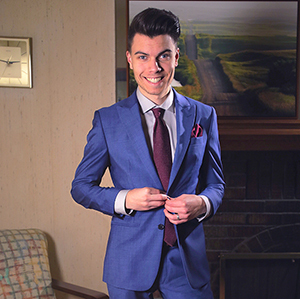 I’m passionate about style, and always have way more fun when the occasion calls for “suiting up”. I got my first custom suit from Eph for my wedding, and it blew me away what a difference a perfectly-fitted suit can make. I want every guy to have the chance to dress sharp, and feel even sharper. When I’m not fitting suits or working film shoots, you can find me watching hockey, collecting cigars, playing the drums, and making Piña Coladas to try and pretend it’s not winter 8 months of the year here. What is your favorite part of being a PSR? The custom monogramming gets me every time. It’s infinitely classy.